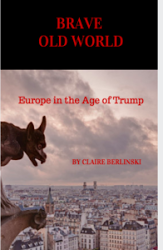 I’m an American novelist, essayist, journalist, historian, travel writer, biographer, critic, editor, and consultant who lives amid a menagerie of adopted stray animals in Paris. I’m the author of There is No Alternative: Why Margaret Thatcher Matters, Menace in Europe: Why the Continent’s crisis is America’s, Too, and Screw the Beautiful Forevers: Life, Death, and Hope in a Pleasant, Middle-Class Gated Community in Delhi. I’ve also written two spy novels, Loose Lips and Lion Eyes. I’m a contributor to Ricochet, a contributing editor of City Journal, and a Manhattan Institute scholar. You can learn more about me and the books I’ve written on Amazon, or read about me on LinkedIn. You can find more of my journalism in my portfolio on Pressfolios. Want even more? You can also follow me on Twitter, Facebook, Medium, and Ricochet. If you like what you see, would you please consider supporting my work on Patreon? Please contribute to it! The project is entirely reader-funded. I appreciate even teeny-tiny donations: If you can only give a little bit, be assured that I’ll hugely appreciate it. You can also contribute via PayPal. If you’d like to hire me for a journalism, writing, ghostwriting, or editing project, please use the contact form.